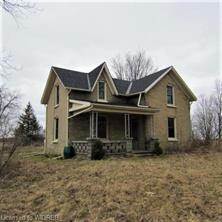 2.73 acre country property nicely set back from the road with a circa 19th century farmhouse and a 3 car detached garage. The brick 3 bedroom home is in need of updating but it has many recent improvements, such as roof shingles in 2018, updated windows, 200 amp breaker panel etc. There is lots of character, with much of the original charm in tacked ready to be rejuvenated, with original solid wood trim work, high ceilings, pocket doors, and 3 bathrooms and 2 porches.